Hi loves, happy Friday!! I'm exhausted but happy because I finally turned in my master thesis. Whoop whoop! Education has been very important to me and I feel like I'm at the end of my academic journey at last. People say I should be proud of myself but I still don't think I've accomplished very much. I don't feel different at least. Relieved yes, but not more skilled than before. Maybe it's such a slow process that you don't realize how much you've learnt. Or academic titles are just a formality for those who hang in there the longest. Anyway, you may call me Master of Science from now on if you like (don't!). Back to today's photos. Glittery pieces like this metallic midi skirt bring a little sparkle to the dark season. Have you noticed how it's dark when you get up and dark when you come home? Worst aspect of winter if you asked me. During that time a little sequin here and a little bit of lurex yarn there can bring the illusion of light back. In autumn we like to light candles whose warm, flickering light gets caught by the shimmering fabrics creating such a nice effect. The midi length is great too. I'm so over short short skirts like I wore when I was 20 and under (except when I'm on vacation). I don't feel comfortable anymore, particularly not at work. 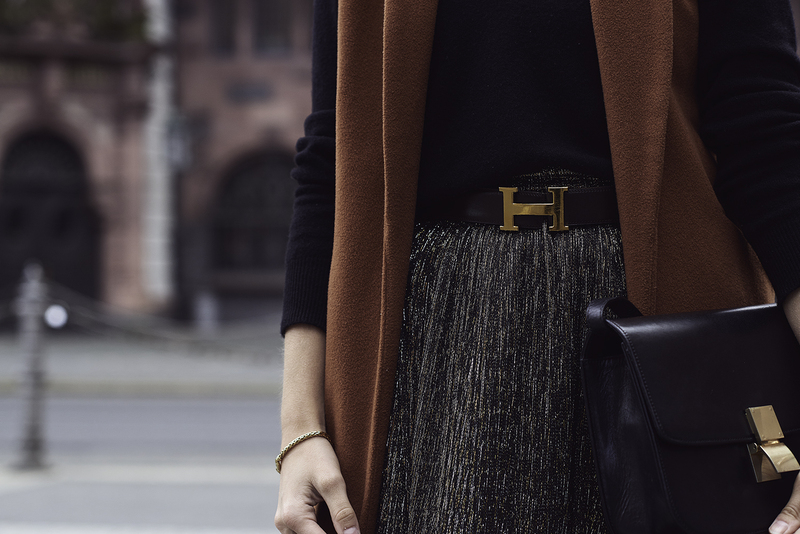 I added my grandma's Hermès belt for an accessory which is always fun to wear thinking of the long history it has. What do you think?